Kellyanne Conway (left), Trump-Pence campaign manager, sat next to Robby Mook, Clinton-Kaine campaign manager, prior to a forum at Harvard University on Thursday. CAMBRIDGE — Top aides to Hillary Clinton accused Donald Trump’s campaign team Thursday of encouraging racism in their extraordinary drive to the White House, provoking a shouting match between the election rivals. The presidential campaign manager conference, held at Harvard University’s Kennedy School of Government every four years since 1972, is usually a place for insider war stories, shared and documented for history. Lead campaign strategists gathered at Harvard this week to formally debrief on the most unpredictable race in US history. However, three weeks after this year’s divisive election, in a conference room with a half-dozen aides from both sides facing each other, the conversation quickly took a remarkably combative turn, highlighting just how deep the enmity between the Trump and Clinton camps remains. Conway accused the Democrats of refusing to accept their loss. The session, led by three national political reporters, lasted 2½ hours. The accusations of racism concerned the role that Breitbart News and its former executive chairman, Steve Bannon, played in the campaign. Bannon left the conservative news website to join the Trump campaign in August and will serve as an adviser to Trump in the White House. He once boasted that under his leadership the Breitbart website served as “the platform of the ‘alt-right,’ ” a white nationalist movement that gained prominence leading up to the election and afterward. Bannon was invited to the Harvard conference but canceled his appearance for unknown reasons. A large protest against his appearance had been planned outside of the conference. 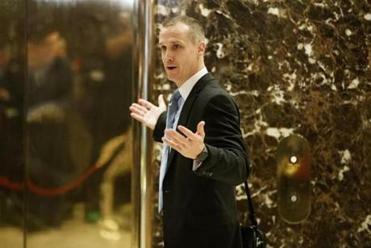 At a forum that was less heated than the earlier encounter, Clinton campaign manager Robby Mook and Conway offered starkly different explanations for the election’s outcome. Mook said that outside interference — including meddling by Russian entities — tilted the results Trump’s way, while Conway portrayed broader strategic decisions as behind the GOP win. campaign over the summer, said that she prevailed upon Trump to play “the happy warrior” and encouraged him to draw energy from his public rallies. That, she said, contrasted with the public image of Clinton. “I said to Mr. Trump, ‘You know, you’re running against one of the most joyless presidential candidates in history,’ ” Conway said. Conway told the audience her campaign mission as Trump’s manager was to focus on a dozen or so swing states where, despite political analysts’ admonitions of demographic disadvantages, she thought Republicans could still win. “The race was about 12 or 14 states,” Conway said. Mook repeatedly insisted that the hacking and releasing of e-mails sent and received by Democrats close to Clinton, including campaign chairman John Podesta, played a central role in Clinton’s defeat. He called for a federal investigation into the prospect that foreign election tampering had played a role. “Congress has got to investigate what happened with Russia here,” said Mook. Conway, on the other hand, said Trump had won because of his ability to read and appeal to blue-collar dissatisfaction. “He was able to tap into the angst — not the anger, the angst — and the frustration of job-holders,” Conway told moderator Jake Tapper. And, she said, despite widespread criticisms of Trump as unqualified to be commander in chief, Clinton’s perceived weaknesses played into Trump’s strengths. “Veracity, trustworthiness, not being an insider — those were also presidential qualifications,” she said. Conway rejected an audience member’s assertion that Bannon is an anti-Semite. Mook acknowledged Clinton’s assertion that half of Trump’s supporters were “deplorables” could have repelled potential supporters. “I think it definitely could have alienated some voters,” he said. Trump’s victories in Midwestern states — which Democrats had confidently seen as a “blue wall” that would help Clinton — were a turning point, as Mook acknowledged. “We were hoping for stronger performance in some sectors,” he said. But, he placed the election’s hinge point squarely on forces beyond the campaign’s control. During a stage-production break in the exchange, Conway suggested that Tapper’s tie may have been a Trump-brand product, leading to one of the evening’s most lighthearted exchanges. “I actually have one that I wore the first interview I did with him, just to point out that it was made in China,” Tapper joked. Jim O’Sullivan can be reached at jim.osullivan@globe.com. Follow him on Twitter at @JOSreports. James Pindell can be reached at james.pindell@globe.com.